For soldiers who are away from home, the holidays can be an especially difficult time. The Holiday Mail for Heroes program, run by the American Red Cross, is a simple way individuals and organizations can show their support to our heroes. Through this program, holiday cards are collected between October and early December and then distributed to military installations, veterans’ hospitals, and other locations across the country and throughout the world. These expressions of care lift the spirits of soldiers and bring them cheer. To learn more about what these cards mean to their recipients, view this video taken at the Walter Reed Army Medical Center. Be sure to sign your cards. Cards should not include a home or email address. Holiday Mail for Heroes accepts only cards. Do not include or send any letters. Salutations should be generic, such as “Dear Service Member.” Cards should not be addressed to specific individuals. No inserts may be included in the cards, including photos. These items will be removed. Please do not add loose glitter to the cards or choose cards with glitter. Glitter can aggravate health issues of ill and injured warriors. For mailing large quantities of cards, please bundle them and place them in large mailing envelopes or flat rate postal shipping boxes. You do not need to include individual envelopes. Envelopes will be removed from all cards prior to distribution. Since the Holiday Mail for Heroes program was established in 2006, over 6.5 million cards have been distributed. And this year, the program is expanding by enabling people to participate through social media. If you use Instagram, Vine, or Twitter, and create a photo or video with a holiday message for America’s service members, use the #HolidayMail hashtag. 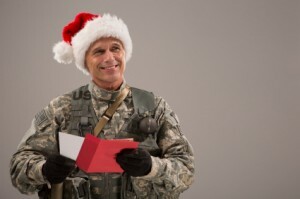 Holiday Mail for Heroes will display your message on its blog to be seen by military across the globe. For more information about the program, as well as tips on how to create a good video, visit the Holiday Mail for Heroes website.